Amazing - Essex registers free online! Does your ancestor appear TWICE on the census? Why can't I enter relatives from other censuses? To visit the main LostCousins site please go to www.LostCousins.com or click here for a password reminder. If you missed the previous LostCousins newsletter (dated 30/5/09), or would like to see it again, click here. All newsletters since February 2009 are still available online. I've long been envious of the online parish registers for north-west Kent that can be found on the CityArk site run by Medway Council Archives Service. I was therefore pleasantly surprised - no, amazed - to discover purely by chance that many Essex parish registers and other records can now be viewed free online, thanks to the Essex Record Office. It's great news even if - like me - you've previously searched microfiche copies, because these high-resolution colour scans from the original registers reveal information that was previously illegible (and as a result I now know the maiden name of my 7G grandmother, which opens up a whole new line of research for me). And it's not only registers of baptisms, marriages, and burials that are online - I've just been browsing a 1929 electoral register. Of course, this is an ongoing project, and it will be some time before all of the registers are available - but I understand that already there are registers from every parish online, usually the earliest to have survived. If online images are available you'll see this multicoloured icon against the relevant result - click the icon, then select one of the images from the drop-down menu (I'm afraid that finding a specific page is a matter of trial and error, because there is no online index). 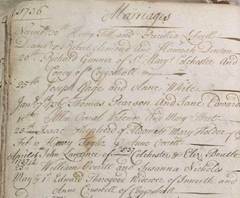 Click on the picture to see a sample image from the Coggeshall register (the marriage of my 7G grandparents Henry Till and Pricillia Leswell on November 30, 1736 is at the top left). It's all too easy to conclude that when we find someone with the right name, in the right area, and around the right time - that it must be our ancestor. But all too often we're wrong to make that assumption - and the worst part is that we might never find out our mistake. Can you imagine anything worse than tracing the wrong line? The International Genealogical Index, commonly known as the IGI, is a major source of problems, simply because it's so accessible and easy to search. Suppose you look up your ancestor's baptism and find two possibilities, both around the right time, and both in the right part of the country - isn't it just a question of figuring out which of them belongs to you? Unfortunately it isn't as simple as that. The IGI is incomplete, and for every 'possible' you've found in the index, there could be another who isn't recorded. If you haven't already done so, I'd suggest you read two articles I've written about the IGI, which you'll find on the Help & Advice page. With the addition of Wales, the Channel Islands, the Isle of Man, the Royal Navy, those aboard on Merchant Navy vessels in port at home or abroad, and (for the first time in a British census) Army personnel and their families in military establishments overseas, the 1911 England & Wales census is finally complete. Remember that credits purchased at findmypast.com can also be used at the 1911 Census site. It's unusual, but not unheard of, for somebody to be recorded twice on the same census. Most usually it's a child who is staying with relatives on census night, but is also recorded as being at home - but there are many other circumstances that can lead to unintentional duplication. In the US a whole month was allowed for census taking, and as a result duplications are rather more common. If one of your relatives was recorded twice on one of the censuses supported by LostCousins then my advice is to enter them twice on your My Ancestors page - otherwise you risk missing out on a 'lost cousin'. "My ancestor was left off the census" is a refrain I hear so often that it can't possibly be true every time - typically only 2-3% of inhabitants were completely missed. More often than not all it takes is a bit of lateral thinking to find an entry that's either wrong, or has been mistranscribed. For a list of useful tips see my article Key Tips for Census Success, which you'll find on the Help & Advice page. LostCousins members often ask if they can enter relatives from censuses other than the ones we've chosen. It seems a reasonable enough request until you realise that we can only match your data with the data entered by your cousin if you have both entered the same relative from the same census. This means that having a wide choice of census years would be counter-productive, since you would most likely choose a different census from your cousin. Does it matter that a few relatives are missing from the census? Not really, because if you can't find them on the census, your cousins probably won't be able to find them either. If you want to maximise the number of cousins you find, then enter ALL of the relatives you can find on the census, and until you've done that, don't worry about the ones you can't find. Remember that the vast majority of your living relatives are descended from collateral lines, so make sure that you enter your ancestors' brothers, sisters, and cousins - especially the ones who had families of their own in 1881. Another 5 counties are now available online at the National Archives of Ireland, and according to the website not only should the 1911 Census be completed in the near couple of months, the entire 1901 Census should be online before the end of 2009. It has always been the plan to add one of them to the list of censuses that are supported by LostCousins, and whilst there are some technical issues to be resolved, I still hope that will be the case - because I know that there are tens of thousands of LostCousins members who have Irish connections. "Just wanted to thank you for helping me to knock down a brick wall with my Irish grandmother. I have been searching for over 30 years to find her family with no success. Your article on the Irish History Foundation helped me to find her Baptism Record and then I found her whole family in the 1911 Census for Ireland. Thank you for all your great tips." Indexes of Canadian censuses from 1851-1891 are now available at the free FamilySearch site. For the 1851, 1861, 1871, and 1891 censuses you'll need to click Search Records, then select Record Search pilot from the drop-down menu. For the 1881 Census (which has been available for many years, and is the census we use at LostCousins) click Search Records, select Advanced Search, then click Census in the menu that runs down the left-hand side of the screen (or else click here). Unfortunately there doesn't seem to be any way to display an entire household from censuses other than 1881 - other than to go to the Ancestry.ca site, where you'll have to pay* unless you already have a subscription that includes Canadian records. In a surprising development findmypast.com has added over 850,000 Australian records. I initially had difficulty finding them at the site, but discovered most of them (relating to New South Wales and Victoria) under the More Records tab, in the Other Records Collection 1320-1996. The remaining entries, all death-related records for the state of Victoria, can be found in the Parish Records Collection 1538-2005, which is under the Births, Marriages, and Deaths tab. Whilst on the subject of Australia, Convicts to Australia is a good site for tracking down early migrants - and it's free; for later arrivals start with findmypast.com, where you'll find indexed passenger lists from the National Archives which cover the period 1890-1960. When I recently received an email headed 'Surman Index', my first thought was that it was from a dyslexic member asking if we had a surname index. But no, it turned out there is indeed a Surman Index, which gives details of about 32,000 Congregational ministers in England & Wales. Thanks to this tip from Fiona, who wrote to me from Scotland, I now know the name of the minister with very, very bad handwriting who baptised my great-great-great-great grandfather Richard Bright at Coggeshall, Essex in 1756. Though Henry Petto (or Peyto) may have had bad handwriting, that didn't prevent one of his descendants founding the famous Unwin publishing house, which was to publish Lord of the Rings two centuries later. The Surman Index is available free online, courtesy of Queen Mary College, London. Do you subscribe to Ancestry.co.uk? My advice is not to renew your subscription when it expires - because you may then get an offer to renew at a discounted rate. In my case I was offered a 20% discount, but I have heard of people being offered even greater discounts. You may recall that last month I offered a free subscription to any member who changed their gas and/or electricity supplier through the free Which?Switch website. One member who did extremely well was Kevin, because not only did he get a free LostCousins subscription, he is going to save £136 a year on his gas and electricity (more than enough to pay for an annual subscription to either findmypast.com or Ancestry.co.uk)! If you're jealous of Kevin's success, why not check out Which?Switch yourself? But please make sure that you click on one of the links in this paragraph, as the commission we receive will help to pay for the next round of improvements to the LostCousins site. I love electronic gadgets, and there are some great deals around - though sadly I'm not in a position to take them up right now. However if you are thinking of buying a new TV, computer, or kitchen appliance it's worth checking out this offer at Dixons (though you'll have to be quick as it runs out at 3pm on June 30th). What particularly caught my eye was an extra 5% off the already low price of this LG 50PS3000 plasma TV, bringing it down below £700 including delivery, which for a 50in flat-screen TV seems pretty amazing! Now for a travel tip. If you use budget airline Ryanair you may have noticed that they often charge the same price in euros as in pounds, even though the exchange rate is currently 1.17 (for example, they were recently offering single flights at £15 or 15 euros all-inclusive). By chance I discovered that it's possible to profit from this - instead of booking a return flight from the UK, book two single flights and you'll be billed for the return trip in euros (even the iniquitous £5 payment handling fee is reduced to 5 euros). Of course, to benefit fully you'll need a Nationwide card, or one of the few others that doesn't charge for euro payments, but even so there's a saving of about 12%. The Amazon.co.uk website has some amazing bundle deals. For example, you can get Microsoft Office 2007 Home & Student Edition (3 users) for only £49.99 when you spend £39.99 on other Amazon products. Or else you can get 50% off Kaspersky Internet Security 2009 when you spend £30 on other Amazon products (which brings the price of the 3 user version down to just £7.72). These are not downloads or pirate versions (which is what you'd normally expect at these prices) - they are brand new, fully packaged, totally genuine products on CD or DVD! Finally, a reminder for youngsters aged 49-54 that you may be affected by a change in pension rules in April next year. Currently it's possible to start taking benefits from a pension at the age of 50, but from April 6, 2010 you'll need to be 55. Remember that drawing a pension and retiring are two different things - you can continue working even though you're receiving a pension - and you can also take your tax-free lump sum without also drawing an income. As with any major financial decision, take advice from an expert before making any commitments - and think extra hard before doing nothing. Ancestry.ca is offering free access until July 3 to the Canadian Passenger Lists Collection 1865 to 1935; you will need to register in order to access these records. That's all for now - I hope you've found some of it relevant to you and your family tree. Please do keep sending in your comments and suggestions for future issues. Copyright 2009 by Peter Calver & Lost Cousins Ltd. Permission is hereby granted to copy or republish this material provided it is reproduced in its entirety, including this notice.